Just what do you mean... KINGDOM OF GOD? European Community Threatened With Collapse? EUROPE is economically at the crossroads. The European Economic Community's agricultural policy has threatened to destroy 25 years of arduous work toward the unification of Europe. 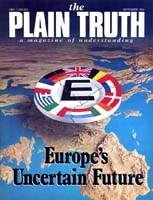 To update readers of The Plain Truth, senior writer John Ross Schroeder interviewed Martin Vasey, spokesman for the Commissioner of Agriculture for the EEC, in Brussels, Belgium. In brief, what is the European — Community's Common Agricultural Policy? We have a common agricultural policy because we are a common market. That is to say, we have decided to abolish all obstacles to trade between member states. But you can't just remove the obstacles to cross — frontier trade. Otherwise the result would be chaos. You have to replace your existing national agricultural policies by a common policy. This process is not 100 percent complete in the sense that you can still leave a considerable margin for member states. For example, we still leave health regulations very largely to member states and that creates a lot of problems for intercommunity trade. We still leave. member states very largely free to spend money on improving infrastructure, encouraging technical training and modernization of farms, though we are trying to strengthen the Community framework for that. The part of the agricultural policy that we really have made Community [responsibility] is market support — the system of guaranteed prices and the means by which you support these guaranteed prices. When people talk about the Common Agricultural Policy what they normally mean is the system of market support that takes up 95 percent of all Community expenditure on agriculture and about 60 percent of all Community expenditure. Since the Community is, after all, essentially an industrial community, agriculture being 5 percent of GNP overall, there is a very great imbalance between the amount of resources we devote to agriculture and the amount of resources we devote to the industrial sector, such as steel, textiles and also the new technological sectors of industry. You can understand from that analysis why the debate over the future of agricultural policy is so immensely important for the future of the Community. The European editor of a major international news weekly said the following about the Community's agricultural policy: "Even the stubbornly optimistic French admit that the... scheme... encourages waste and sloth, and produces little more than unsalable mounts of butter and surplus dunes of powdered milk." Would you agree with that statement? No, I would not agree with that statement, and I would be very interested to find out which Frenchman agrees with it as well. The general view is that it has been immensely successful in encouraging the development of European agriculture — which 20 years ago was still very largely based on small peasant type farms — into a modern intensive form of agriculture. In many sectors the Community has yields exceeding those in the U.S. The cost has certainly risen beyond what the member states consider reasonable, largely because of the growing surpluses in certain sectors, but these are the problems of success, not of failure. And these problems are also being met with on the other side of the Atlantic. There are two kinds of agricultural policies in the world. You've got, on the one hand, the European Community and North America, which are having to deal with the problems of success and how to control the tendency of production to outrun the available markets. And, on the other hand, you have the socialist countries in Eastern Europe and a large part of the Third World, which are increasingly unable to feed their populations. It would of course be nice to have an agricultural policy that was perfectly balanced, but if you've got to have a policy that does not achieve equilibrium it is better to have to deal with the problems of surpluses than it is to deal with the problems of shortages. Coming to the more specific criticisms, it is true that the Community has record stocks of butter and skimmed milk powder at the moment, by which I mean publicly purchased stocks. We also have very high stocks of beef. But apart from that the stocks are not unmanageable. I should add that the United States has also got very large stocks of butter, cheese and skimmed milk powder and for very much the same reason. We have both provided our producers with guaranteed prices and unlimited public purchasing of all surpluses at those prices. The result is that we have both got a butter mountain and skimmed milk powder mountain, and as a matter of fact the Americans have got a cheese mountain as well. We are both seeking in our own interests a way out of this. The American way is basically to hold down the price and to pay people to get out of milk production. We are rather skeptical that paying people to get out of production, if you don't actually forbid the others to go on producing more and more, will work. We tried that in the '70s and in our case it didn't work. We are now examining the possibility of a quota system. It wouldn't pay anyone anything to get out of milk production. We would go on offering them a reasonable, guaranteed price, but we would impose a prohibitive levy of 75 percent of the current market price on all production over a ceiling. So we are imposing, or planning to impose, a severe cut on the amount of milk that our farmers are allowed to produce. This is extremely unpopular politically. It's going to be extremely difficult to get unanimous agreement in the council, but we think it's the only possible solution to our difficulties. And if it goes through then we will be able to dispose of our existing butter and skimmed milk powder mountains over the course of the next year or two — at a certain cost it's true — by means of special disposal schemes: for food aid, for sale to certain categories of the population, and in fact by selling it cheap to whoever will buy it. With regard to beef, the main problem is that the economic recession has led to a falling consumption. We are proposing various countermeasures. What is fundamentally wrong with the agricultural policy from a point of view of the Community as a whole? What is fundamentally wrong — and this has been said by numerous people in the Community and by the Commission in particular for the last four or five years — is that we have tended to give an unlimited price guarantee for unlimited volume of production irrespective of the capacity of the market to absorb that production. The justification for our policy has always been partly to ensure food security. You should remember that for most of this century Western Europe has been unable to feed itself, and in the lifetime of those people now in power, food shortages have been the number one political problem. Even now Europe is still only 90 percent self-sufficient whereas the United States is considerably more than 100 percent self-sufficient. Maintaining food security and raising the level of self-sufficiency is, with the possible exception of the United Kingdom, a widely shared aim of agricultural policy in Western Europe. We have always justified our policy by the enormous social importance of the farming community that in Europe is characterized by the very large number of small family farms. To give you one example, there are as many farmers in Italy as there are in the United States, though Italy produces probably a 10th of the agricultural production in the United States. Therefore you have got a real social problem which cannot be solved overnight, even in five or 10 years. We have, as a matter of fact, reduced our farm population by 50 percent in the last 20 years. But we still have twice as many people on the land in the European Community as there are in the United States for a roughly equivalent volume of production. And so there is a very strong social motive to our agricultural policy. But this having been said, everyone is agreed, now that the Community has become a net exporter of cereals, meat, dairy products and wine, that we cannot go on providing an open-ended price guarantee for unlimited quantities of production irrespective of the capacity of the market to absorb that production. I'm repeating myself, but this is partly because the Commission has in fact repeated itself several times in the last few years, because it is extremely difficult to get member states and the farming organizations to give up what they have come to consider as their rights. We implemented quotas for sugar several years ago and we are currently discussing, as I explained, the implementation of a quota system for milk. For other crops, particularly cereal and oil seeds, we have introduced what we've called a system of guaranteed thresholds. We fix a volume of production that we think reasonable; if production continues to rise above that level, we reduce the guaranteed price accordingly. There are also some other products for which we use a kind of deficiency payment system. For processed fruit we are engaged in putting a limit on the volume of support. In some sectors such as beef we are hesitating about what to do, but we have now established the general principle that price guarantees cannot be open-ended. It has been said by The Economist that EEC farm prices are twice that of world market prices. Such guaranteed prices have caused British farmers to put marginally productive land into cultivation to the ecological harm of the British countryside. Could you comment on this phenomenon? The gap between EEC — guaranteed prices and world prices is often quite considerable. It has been over 100 percent, but normally it's the region of 30 or 40 percent, which is high enough. But I do think one should avoid exaggerations in this area. The other question you raised concerns the effect on the environment, particularly the ecological consequences of the Community's agricultural policy. I would put it slightly differently. Modern intensive agriculture obviously contains a threat to the environment; for example, the extensive use of pesticides and fertilizers and the plowing up of marginal land. It is these that comprise the main threat to the environment. And I should add the destruction of hedgerows and woodlands in England, as well, something that I regret very much. How much of this is the result of high guaranteed prices? The relationship is not very clear, but if you have low prices the pressure on farmers to survive by increasing production is also very severe. But if you look at the Community as a whole you would find that the agricultural policy had a very important role to play in preserving the environment. If you fly around most of Europe, you will notice the pattern of settlement is very different from what you find in North America or Australia. You have little villages only a few miles from each other and then the small towns. There is a network of human settlement that has existed for centuries and that is integrally related to the structure of agricultural production. If you were to apply a completely free market philosophy to agriculture you would in a very few years depopulate vast areas of Western Europe, leading to the disappearance of many villages, possibly even of small towns. The European countryside is a man-made phenomenon and the maintenance of a family-based agriculture is essential to the maintenance of the European countryside. So the argument cuts both ways. There is a case for putting limits on certain types of agricultural development. This is one of the areas I spoke about earlier that is still mainly a question for national governments. The British government, for example, gives subsidies to farmers to plow up marginal land. It's not the Community that gives them. The Community provides the' price guarantees that may make the whole operation economically viable, but it is the British government that ever since the wartime food shortages has pursued a policy of encouraging farmers by means of financial incentives to increase the amount of land under cultivation. Since Britain is now more than self-sufficient in cereals and not doing badly in animal products, maybe the time has come for the British government, within the framework of its national responsibilities, to ask whether these financial subsidies for plowing up land are really justified. What Common Market countries will be hurt the most if subsidy levels are cut rather drastically? Those who will be hurt most will be those most dependent on agriculture in the first place. And secondly, those that have the lowest GNP per head and cannot easily afford to make up the loss of income to its farmers by direct national aids. I very much doubt if countries like Ireland or Italy or Greece — which are dependent on agriculture and less developed technically — could find the financial resources either to go on supporting farm incomes in the way that incomes have been supported over the last 10 years, or to go on financing the modernization and improvement of agriculture. The countries that would be hurt worst are' Ireland, Italy and Greece, with France occupying a rather intermediary position: The Benelux countries plus Germany and Denmark would all be hit because they have all got an important agricultural sector. Nevertheless they've got relatively greater financial resources they could use. In February the European Commission Vice President, Christopher Tugendhat, said in London: "The Community is virtually at the limit of its financial resources." What must be done to save the Community's agricultural policy and diffuse the budgetary crisis? There is no doubt that the Community has left it to the 11th hour to make the necessary changes. The Commission, which is responsible for the management of the Common Agricultural Policy and also for making policy proposals, has been urging reforms on the Council of Ministers for the past three or four years, but with rather limited success. Now we are unfortunately in the situation where there is no longer any financial room for maneuver because the Community has, as Vice President Tugendhat said, practically reached the limit of its budgetary resources under the treaty. If the Council of Ministers adopts all the proposals that we have made for reforming the Common Agricultural Policy and in addition agrees to a virtual price freeze, then we might just be able to stay within budget limits in 1984. I profoundly hope that we will be able to do that. If the Council of Ministers can't agree to all the reforms or can't agree to the price freeze — it's very difficult at one and the same time to accept a cut in production and a freeze on prices, which is what we are proposing in the milk sector — then obviously we will not be able to stay within our budget ceiling. Would you set the Common Market in historical context? Sometimes we forget that the EEC has only been in existence for 25 years. Although the Western European nations may be old — actually not all of them are — the European Community itself is very young. It's been in existence 25 years, which is not very long in historical terms. The United States has existed for two centuries. I think most people would agree that in the United States the "melting pot" is still in many ways an imperfect one; that is to say, there are still very strong regional senses of identity within the United States in spite of the fact that the U.S. has a common political system, common language and 200 years of history. The European Community is a recent creation. It's limited to the economic sphere and increasingly the diplomatic, but there has only been a period of about 20 years for the process of European integration to become assimilated by our national political systems, and we are still a long, long way from any kind of political integration that you have in older federations like the United States or Switzerland.